New Delhi: India and the United States on Thursday began a new generation of military and security cooperation by signing Communications Compatibility and Security Agreement (COMCASA). An announcement on the significant agreement came at the end of the inaugural 2+2 ministerial dialogue between the two countries that also focused on ensuring maritime freedom and international law in the India-Pacific region. “They welcomed the signing of a Communications Compatibility and Security Agreement (COMCASA) that will facilitate access to advanced defence systems and enable India to optimally utilise its existing US-origin platforms,” a joint statement issued at the end of the bilateral dialogue declared. 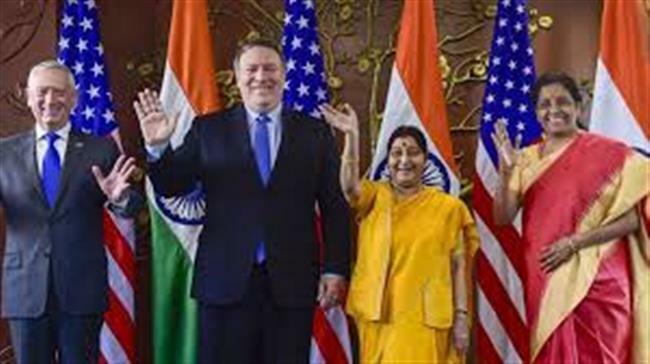 The bilateral dialogue was attended by U.S. Secretary of State Michael R. Pompeo and Secretary of Defense James N. Mattis and their Indian counterparts Sushma Swaraj and Nirmala Sitharaman. India and the U.S. would also hold a first-ever tri-service exercise on the east coast of India in 2019, Ms. Sitharaman announced. An important element of Thursday’s discussion was starting the process of closer private defence industry collaboration that would allow Indian defence manufacturers to join the U.S. military supply chain. The two defence ministers also announced their readiness to begin negotiations on an Industrial Security Annex (ISA) that would support closer defence industry cooperation and collaboration. India and the U.S. signed the General Security Of Military Information Agreement (GSOMIA) years ago and it allows the sharing of classified information from the U.S. government and American companies with the Government of India and Defence Public Sector Undertakings (DPSU) but not with Indian private companies. An ISA is required to enable private Indian participation in defence production and is particularly important as India opens up defence manufacturing to the private sector in a big way. To further defence innovation, a Memorandum of Intent was signed between the U.S. Defense Innovation Unit (DIU) and the Indian Defence Innovation Organization — Innovation for Defence Excellence (DIO-iDEX), which will look into joint projects for co-production and co-development projects through the Defense Technology and Trade Initiative (DTTI). Both sides maintained that the Indo-Pacific region has emerged as an important part of bilateral cooperation and emphasised need to keep it open for maritime trade and free of disputes.